Some nights you just want something super easy. Not every meal has to be fanciful or pretty to look at. Some meals are just about filling your family with something delicious. That’s these easy tacos. This is another one of those meals that we probably have once a week. They’re super easy to make after work and don’t take very long to get on the table. You can make them simple with only a few ingredients, or have all the fixings, whatever your family likes. I love recipes that you can really modify to your own families tastes. Brown the ground beef or turkey in a large skillet over medium heat, breaking up the meat as it cooks. Drain the fat. Add in the salsa and let the meat cook through and really soak up the salsa. Get your tortillas and toppings and assemble your taco! It’s as simple as that! 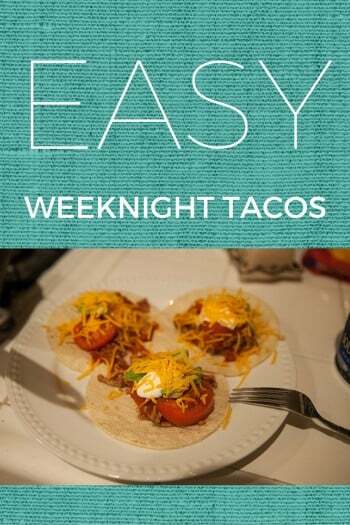 3 steps and about 20 minutes to delicious and easy tacos! If you’d like to see more easy weeknight meals, be sure to follow my Pinterest board!